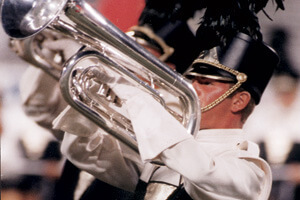 Of the 16 times the Glassmen have been a DCI World Championship finalist, 1998 was the first of three years the corps has placed as high as fifth place. (The other two years were in 1999 and 2001.) From 1986 through 1995, a total of 10 years, the corps had improved upon its position each and every year from the season before, a feat no other corps has attained. After building up to eighth place in 1997, the corps shocked a lot of other units as the season progressed. In the first show of the season on June 13, the Glassmen came within 1.10 of Phantom Regiment and 2.20 of the Cavaliers, and three days later beat both those corps. After coming in sixth at the World Championship Quarterfinals in Orlando, the Toledo corps topped the Madison Scouts the last two shows of the season and finished in fifth place. "Dreams of Gold: The Music of Alexander Borodin" was a significant step up the sophistication ladder for the corps. In many ways, it had no heritage in any of the Glassmen shows that preceded it, except for 1996, which pointed the direction to the corps' new style and level of refinement. A short introduction of the main theme of "On the Steppes of Central Asia" led into a powerful fanfare from "Prince Igor" that made fans sit up and take notice. The power of the brass sound was nothing like anything the corps had ever produced before. With a color guard that was unexpectedly elegant and a visual program that looked nothing like any of the previous years' efforts, the production left many fans wondering how they didn't see this corps coming down the pike. Suddenly, Glassmen were one of DCI's most sophisticated corps, and many fans didn't know quite what to make of this. Performance excerpt of the 1998 Glassmen. A percussion feature introduced "Notturno" from "String Quartet No. 2 in D major," a work that seemed to revel in subtlety. Lovely and restrained, the haunting melody showed fans that the corps knew how to create breathing space in between the more overtly dramatic moments of the show. Building up to a big climax that contrasted the understatement of the prior measures, the music rapidly fell back down in volume, creating a beautiful moment of simple beauty. That was all to change in the "Finale" from "Polovetsian Dances" and "Symphony No. 2 in B minor." Like the roar of a tiger, the opening strains shook up anyone who might have become a bit too complacent during the previous work. The big push of the piece featured the sudden appearance and just-as-fast disappearance of giant blue flags, picked up by the rifles and rapidly flashed across the front of the field a handful of counts prior to the entire color guard revealing bright yellow flags that ended the show. This was the show that proved to the entire drum corps community that the Glassmen had grown up and would become a perennial World Championship finalist. This week only, you can save on 1998 World Championship Audio and Video Performance Downloads on the DCI Fan Network. Buy the 1998 Glassmen Video Performance Download. (Available this week only for $3.99. Regular price: $4.99.) Buy the Audio Performance Download bundle of all 12 Finalists from 1998. (Available this week only for $15.99. Regular price: $19.99.) Offer ends Monday, April 11 at 8:30 a.m. ET.